Improv Cincinnati is home to a particular kind of improv: dynamic performances that inspire a spectrum of emotions. In any given show, we want our audiences to laugh (of course! ), but more importantly, we want them to care about the characters and to feel like the scenes have taken them on a thematic journey. When you see a "Love Square" or "Triptych" performance, you know you're experiencing this style of improv. True Theatre, one of Cincinnati's most iconic storytelling shows in similar style to New York City’s “The Moth,” shares IC's philosophy and approach for creating captivating and emotionally resonant stories. A typical show features five stories from five different storytellers and centers around a theme. True Theatre's most recent show on April 30, “trueBASEBALL,” was in the beautifully remodeled Memorial Hall. "The stories took you on a journey and had uniquely different perspectives,” said IC co-founder Colin Thornton. “Whether it was from a MLB Hall of Famer George Foster, or the woman who moved to the United States from Israel and experienced a baseball game for the first time at the age of 19, or the mother of a peewee league champion." IC: How long has True Theatre been around, and what has been your evolution as a group? Dave: We are in our eighth season. Having started in 2010 with my co-founder and friend, Jeff Groh, we went from a fledgling storytelling group to now having 501(c)3 (nonprofit) status and having a six-person board and additional volunteers who help produce our shows and want us to grow. Everyone involved takes great pride in the work we do. We feel the power of story after every show when we are able to mingle with our audience and hear their reactions. It's such a great feeling! How do you select stories for your shows? We used to meet with people one-on-one who were interested, listen to their story in private, evaluate, and go from there. It was fun, but it took a long time. Now, we have people pitch their stories in a live setting. Of course, not everyone can be selected for the show, but it’s a fun and engaging way to have people share their story in an intimate setting on a stage. Plus, it gives us a reason to be out in the storytelling and performing community more frequently than when we put on a show every few months. Kind of like improv, you get up there and share a part of yourself and see what happens. What are you looking for, in terms of stories, for your shows? Since we always have five stories, we are always looking for a diversity of perspectives centered around the theme. Take our July show’s theme, “Blue.” A story could approach the theme from feeling blue, from the color, or something else we wouldn’t normally think of. When we produce a show, we’re all about finding those different and unique angles. I’ve told some over the year.s. A major life highlight was being able to tell a story on the stage when The Moth came through Cincinnati. What got you into storytelling in the first place? I don’t think there’s a true beginning for me, but I remember being in the back seat of my parents’ car as a child, and they’d listen to Harry Chapin’s Greatest Stories Live. I was completely fascinated by how so many of them told a complete story, and I loved each one! Maybe this didn’t turn me on to storytelling, but it was certainly early evidence of how much I responded to them. What’s your favorite story, if you had to pick one? It’s simple things like that. It was just a mundane life event--a man and his son going to the movies, but it uncovers a lot about honesty, being a good person, relationships, and more. Some of my favorite stories are simple moments like this one, that contain so much meaning. You can find archives of past True Theatre seasons and shows on their website, Facebook albums and their YouTube channel. True Theatre’s next show is "trueBLUE" on Monday, July 23, at Memorial Hall. 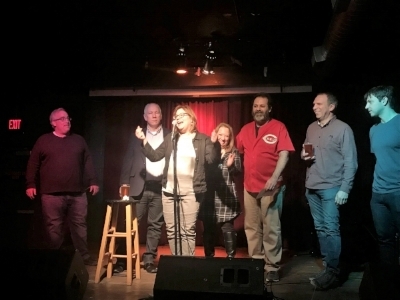 If you have s story you’d like to pitch, you can audition at Myrtle's Punch House on Thursday, May 17, at 7:30 p.m. Find more information here. You can also catch Dave Levy at IC’s show at the Clifton Performance Theatre May 26. Keep an eye on our Facebook page for specific details.